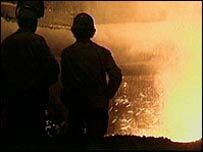 Over 200 jobs are being slashed at the Corus steelworks in Scunthorpe. The job losses come at the same time as a major investment is announced at the North Lincolnshire plant. Around 156 jobs will go in the Heavy Section Mill, which will close later this year, and 80 jobs will be lost at the Plate Mill over two years. At the same time the company has announced an investment of £32m at the site as part of a restructuring and profit boosting move. Unions at the plant say they are surprised by the extent of the job losses and will be talking to those affected. Eddie Lynch, the assistant general secretary of the ISTC-The Community Union, formerly the Iron and Steel Trades Confederation, attacked the decision. He said: "Whilst the ISTC welcomes the new investment announced by Corus at their Scunthorpe plant, the union believes they way that they have handled the announcement (of job losses) is a disgrace. "The decision to close the Heavy Section Mill after years of under-investment shows that, faced between investing to reclaim market share or leaving it to a competitor who has constantly invested, Corus take the short-term approach. This cannot carry on." On the Corus website the firm says the job cuts and investment in production facilities for rod and plate products are part of the "Restoring Success initiative". Andrew Page, the managing director of Corus Construction and Industrial said in an online statement: "We are taking action to focus on those areas that offer us scope for growth and profitability." "We will be doing as much as we can to mitigate the effects of the job losses."